Asus ROG Phone has officially been launched in the Indian market on Thursday. The gaming smartphone was first unveiled globally by the company's gaming brand Republic of Gamers (ROG) at Computex 2018 in June this year. The highlight of the smartphone is that it is claimed to be the world's first smartphone with a 3D vapour-chamber cooling system, and also features a carbon pad and copper spreader for additional cooling. 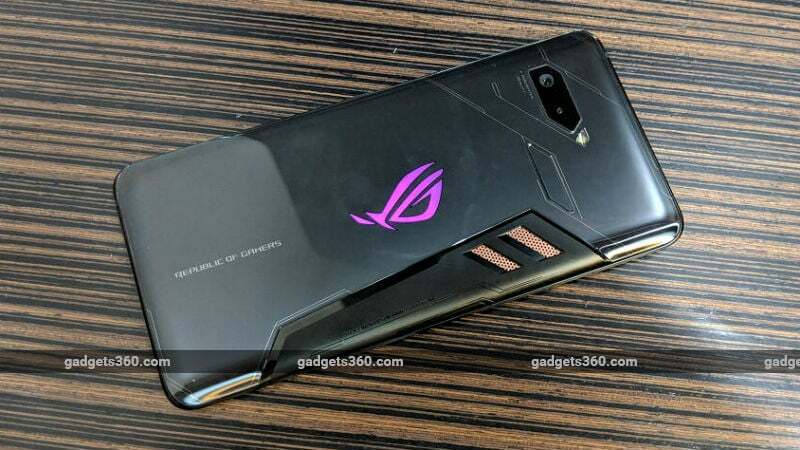 At the launch event in India, Asus officially announced the ROG Phone price in India, release date, and launch offers. The smartphone is amongst the first gaming smartphones in the current crop, with others being the Xiaomi Black Shark, Xiaomi Black Shark Helo, Nubia Red Magic, and Nubia Red Magic Mars. All of these smartphones tout features like special cooling, controls, and displays, apart from top-of-the-line specifications and massive batteries. The most notable features of the Asus ROG Phone include ultrasonic AirTrigger touch sensors, a gamer-centric design with side-mounted ports optimised for landscape-mode, an AMOLED display with HDR visuals, a 90Hz refresh rate, and a 1ms response time. Additionally, it is powered by a special speed-binned Qualcomm Snapdragon 845 processor clocked at up to 2.96GHz, paired with Qualcomm Adreno 630 GPU. Asus also says that Asphalt 9 has been optimised for 90Hz displays. Pricing for the accessories has also been provided: Professional Dock will be available at Rs. 5,499; GameVice (Joy stick) at Rs. 5,999; TwinView Dock at Rs. 21,999, Desktop Dock at Rs. 12,999, ROG Phone Case at Rs. 2499. A Jio offer on the Rs. 509 plan gives 4GB data per day and Rs. 5,000 cashback. The all new Asus ROG Phone runs ROG Gaming UI, based on Android Oreo. The smartphone features a 6-inch full-HD+ (1080x2160 pixels) AMOLED display and boasts of 90Hz refresh rate and 1ms response time with HDR. Additionally, the smartphone's display comes with a 108.6 percent DCI-P3 colour gamut and 10000:1 contrast ratio. One of the key highlight of the handset is a custom Qualcomm Snapdragon 845 SoC clocked at up to 2.96GHz, along with a gaming-optimised Qualcomm Adreno 630 GPU. The Asus ROG Phone comes in a 8GB of RAM variant. In the camera department, the handset features a dual rear camera setup with 12-megapixel (Sony IMX363 sensor, f/1.7 aperture) and 8-megapixel (120-degree wide angle) cameras. AIt also has an 8-megapixel front camera for capturing selfies. In India, Asus has launched the ROG Phone mode that comes with 128GB of inbuilt storage. Connectivity options in the ROG Phone include Wi-Fi 802.11a/b/g/n/ac/ad, Bluetooth 5.0, GPS, AGPS, Glonass, USB Type-C port, NFC, and 3.5mm jack. Sensors on board they handset are an accelerometer, ambient light sensor, compass, gyroscope, proximity sensor, and ultrasonic AirTrigger sensors. It bears a fingerprint sensor on the rear panel. The ROG Phone features a 4,000mAh battery and supports Quick Charge 3.0 on the bottom port and Quick Charge 4.0 (30W) on the side-mounted port. According to Asus, the battery is capable of getting to 60 percent of charge in 30 minutes. There is also IPX4 rating that confirms splash-resistant body. Notably, the Asus ROG Phone measures 158.8x76.2x8.6mm and weighs 200 grams. Coming to the features, the Asus is touting the presence of a GameCool vapour-chamber cooling system, with detachable AeroActive Cooler for extra cooling in the ROG Phone. The smartphone comes with side-mounted ports and two programmable ultrasonic AirTriggers and advanced force-feedback haptics. It features the optional TwinView Dock for dual-screen handheld mode. The Asus ROG Phone has a Mobile Desktop Dock for desktop-style gaming and a Gamevice controller with WiGig Dock using 60GHz Wi-Fi for big-screen gaming. The handset also features Asus Aura RGB lighting and Aura Sync support and ASUS HyperCharge direct-charge technology. Also, wireless streaming options like Miracast are rated at 500ms of latency.